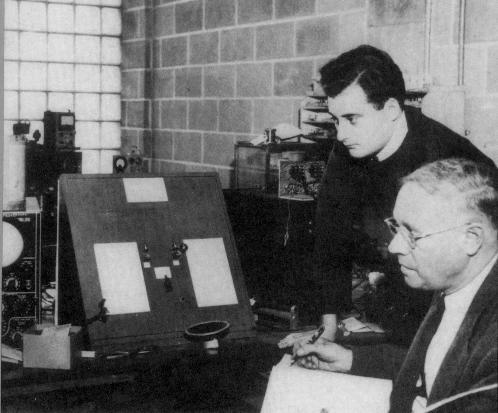 Seymour Benzer (standing) and Karl Lark-Horowitz in the Purdue physics laboratory. Courtesy of Seymour Benzer. During the period 1935-1941, research activities in the physics department proceeded almost as if America's entry into World War II had been forseen and that the department would play an important role in the associated war effort. The number of tenure/tenure-track faculty almost doubled, increasing from 7 to 13 during this period and the research productivity as indexed by publications in the Physical Review went up proportionally to nearly 25 publications per year. It was during this period that the department became a major player in nuclear physics research, with the construction of a Van de Graaff accelerator and, more importantly, a cyclotron which would give the department unique capabilities for carrying out research during war time. As envisioned, the Van de Graaff accelerator was designed to produce a stream of neutrons through "high energy" deuteron-deuteron collisions with the resultant neutron flux then being used to study neutron diffraction and neutron activation of heavy elements. Three graduate students, R.E. Schreiber, R.E. Holmquist and W.A. Miller, worked on and completed the construction of this accelerator in 1937 at a total cost of only $825.62 above the cost of labor! Unfortunately, the resultant 250 KeV neutron beam only had a flux of about 0.25 milliampere which was too small to be useful for studying neutron diffraction. However, two years later in 1939, following the discovery in Germany by Otto Hahn, Lisa Meitner, and Fritz Strassmann of the fission of uranium when bombarded with low energy neutrons, the Van de Graaff was put to use to study fission fragments. Detection of the fragments was done by the use of photographic plates. ...The importance of this research project lays in the following: with particles of such high speed it is possible to produce artificially in the laboratory radioactive substances which otherwise can be purchased only at rather high cost from natural sources. If the construction of these magnets can be made more compact, and the cost of building and running them can be reduced, there is no doubt that they will be used in the future by all laboratories -- physical, medical and biological -- wherever radioactive material is desired or necessary for research. ....In this state we are the only institution undertaking this type of research, and we know that if this work is developed it will have the support of the medical and biological laboratories in this state and surrounding states. By December of 1938, the cyclotron was producing a useful current of 3 microamps of 8.3 MeV deuterons; a current sufficient to undertake a variety of cutting-edge scientific studies in nuclear physics. Studies of nuclear reactions were begun immediately and these continued throughout the long life of the cyclotron. In addition, Lark-Horovitz who had been interested for a number of years in the application of physical techniques to the solution of biological problems, used the cyclotron to pioneer radioactive tracer methods. Assisted by Dr. Herta Leng, who was an AAUW(3) research fellow in the department at the time, and Dr. Donald Tendam, Lark-Horovitz began an extensive program using these techniques. One of these studies dealt with the uptake, distributions and excretion of sodium and potassium in the human body; another was concerned with the distribution of these two elements in the human blood cell; and a third dealt with the testing of enteric coatings for medications. As one measure of the growth of the cyclotron program, in 1939 eight graduate students were actively engaged in nuclear physics research. As part of their various theses, they constructed a broad spectrum of nuclear instruments including Geiger counters, ionization chambers, linear amplifiers, a small cloud chamber, and a semi-circular beta-ray spectrometer. During the following two years they carried out a variety of projects using these laboratory instruments. In June of 1941, six of these graduate students, R.L. Doran, D.R. Elliot, A. Guthrie, W.A. Miller, R.E. Schreiber, and R.N. Smith, each received the Ph.D. degree for research for which the successful operation of the cyclotron was indispensable. For its research output in nuclear physics during this pre-war period, the Purdue physics department received nationwide recognition. The number of its publications in nuclear physics continued to grow and it was able to attract as visitors a host of the most distinguished physicists of that era--including several Nobel Laureates--who gave seminars and short courses. Included among these were well known luminaries: F. Landau, R.H. Fowler, E. Segre, I.I. Rabi, H.A. Bethe, N. Wiener, A.H. Compton, E.O. Lawrence, E. Teller, W. Pauli, V.W. Weisskopf, E. Wigner, J.R. Oppenheimer and W.E. Heisenberg. The later two were destined, during World War II, to head the A-bomb efforts in the United States and Germany, respectively! Also during this period Lark-Horovitz was able to attract several world famous people to accept positions in the department. One of these was Professor Karl W. Meissner who because his wife was Jewish felt it best to flee Germany. He first accepted a position at the Worchester Polytechnique Institute and then came to Purdue as head of its spectroscopic institute. He and Lark-Horovitz initiated Purdue's entrance into the field of the optical properties of semiconductors by making the first optical determinations of the dielectric constants of germanium and silicon. Another, was Julian Schwinger who came to Purdue as a Professor straight from a post-doctoral position at Berkeley. Lark-Horovitz had to go over the head of the Dean of the College of Science and Humanities directly to President Elliott to obtain approval for Schwinger's appointment. Schwinger worked mostly during the night. Sometimes his students went to his room at the Memorial Union late in the afternoon to wake him, and go with him for a breakfast, Usually his lectures continued late into the afternoon until he decided he had covered all of the material. The wives of his Graduate students used to complain that they never knew when their husbands would come home for dinner! Robert Sachs and Cornelius Lanczos were two other well known scientists Lark-Horovitz was able to attract to the faculty of Purdue during this period. Finally, as if anticipating the additional space that would be required for the department's role in the war effort, the construction of the new physics building on Northwestern Avenue was completed and made ready for occupancy in August of 1941. Shortly thereafter the staff made the move from the old physics building (which then became the Biology Annex(4)) to the new location. This transfer, of course, required the dismantling of the cyclotron and reassembling it in the new location, a very arduous but necessary task. The physics building was dedicated as the Charles Benedict Stuart Laboratory for Applied Physics during a two day conference on problems of modern physics that was held on June 19-20, 1942, at Purdue. At almost the same time, two young instructors in the department, Drs. L.D.P. King and R.E. Schreiber, assisted by a number of graduate students, were completing the year-long task of dismantling the cyclotron, transporting the components from the old to the new building, reassembling it and putting it back into operating condition. With this task completed and with America's entry into World War II six months earlier the future of these two instructors as nuclear physicists was somewhat cloudy. However, a variety of things were in the wind and at the urging of Karl Lark-Horovitz, who hinted at the possibility of a new nuclear project of some type, the two decided to stay with the cyclotron. The first intimation that King and I had of this nuclear project was a meeting attended by K. Lark Horovitz, Hans Bethe, Marshall Holloway and the two of us. Dr. Bethe was already well known at the time as a nuclear theorist at Cornell. Dr. Holloway, although unknown to us was introduced to us as the chief investigator of an experiment that might make use of the Purdue cyclotron and which would be very important to the war effort. If we agreed to participate, we would be relieved of our teaching duties and would be spending full time on the project. We were given no further details until we agreed to participate and each of us had signed a secrecy agreement. We both agreed and very soon, Drs. Holloway, and Charles P. Baker, both from Cornell University moved to West Lafayette, and we started work on the project. Our first task was to seal off the cyclotron laboratory with locked doors and barred windows and to hire a security guard. We were then told that what was desired was the lowest (sic) energy possible from the cyclotron that would produce a reasonable monoenergetic beam. This was a blow to King and me since we had been working for many weeks to set the cyclotron to produce particles of the highest possible energy. However, we went to work, installed induction coils in the oscillator circuit to slow it down, reduced the magnetic field and completely retuned the system to get down from about 10 MeV to the range of 0.5 to 1 MeV. Once this was accomplished we were finally told of the experiments that we were to carry out. These two experiments were conducted with the Purdue cyclotron during 1942-1943 and were published in the classified literature as Los Alamos Technical reports, numbered LAMS11(6)and LAMS2(7), respectively. Interestingly enough, even though these reports were classified as secret the particles were not identified in the reports but were encoded by the scheme:D = 20; T=30; ; 2He3=230. Both reports were eventually declassified but only long after the end of the war. At the time of these secret experiments at Purdue, it was known that enormous amounts of nuclear energy, in contrast to chemical energy, could be released in one of two ways: (1) by the fusion of two heavy isotopes of hydrogen, say deuterium and tritium, into the more stable helium nucleus; and (2) by the fission of a heavy element such as uranium into lighter and more stable nuclei. But it was not known at the time which of these two processes had a higher probability of, igniting a self-sustaining nuclear chain reaction and thus would be more useful in designing a weapon of war. Thus, both possibilities were being studied under the direction of the Office of Scientific Research and Development, the predecessor of the Army Corps of Engineer's Manhattan Project. To be sure King and Schreiber did not know, at the time, why the two cross sections they were measuring were important nor how they fitted into the overall plan. For that they had to wait until 1943 when they were invited to--and subsequently transferred to--Los Alamos. Our supply of tritium, we were told, was obtained by dissolving a beryllium target that had been bombarded by the Berkeley cyclotron, and was probably the largest sample of tritium in the world. The tritium itself came to us in the form of a gas sealed into a small glass capsule. Small amounts of this tritium gas were then carefully metered out and mixed with enough ordinary hydrogen to serve as a feed gas for the ion source of the Purdue cyclotron. With the proper adjustment of the cyclotron, only the tritium ions were accelerated to the appropriate energy and the ordinary hydrogen was scavenged by the cyclotron pumping system. With the proper adjustments of the cyclotron a beam of energetic tritium ions would spiral out from the ion source, gain energy with each revolution, and finally be extracted and led into the target chamber. Electrodes placed in the chamber detected the very tiny pulses from the tritium ions and the much larger pulses when fusion occurred. Tedius but straightforward calibrations and calculations eventually yielded the cross-section values. The 2He3 experiment was very similar, our supply being helium by-products from a liquid air plant. Dr. A.O.C. Nier of the University of Minnesota carefully processed this helium to enrich its He3 content. Again we were the custodians of a very rare and valuable material. Eventually, Dr. Bethe was convinced that our peak value for the D-T reaction of 2.8 barns was valid. So in September 1943 we shut down, restored the cyclotron to its original 10 MeV configuration, turned it over to Don Tendan and shipped all classified materials to Project Y. We had been contacted earlier in 1943 with an invitation to join Project Y, "near Santa Fe, New Mexico". At that time we still did not know the real objective of the project but knew that many prominent nuclear physicists were involved. It took some serious discussions with our wives and with each other but eventually we all agreed to take the plunge. Upon arrival at Los Alamos we were finally told what the Manhattan Project was all about and that we were, as a team, to design, build and operate the world's first enriched uranium reactor. With regard to the remaining members of the Purdue physics department, at some point in late fall of 1943, nearly two-thirds of the faculty and graduate students engaged in nuclear research at Purdue, simply vanished from the campus all leaving behind the same post office box as a forwarding address. The locals of course, had no idea where they went, but assumed naturally that it was somehow related to the war effort. Only much later did they discover that Los Alamos, New Mexico, had been their destination. Not much is known of the specific activities of this group while at Los Alamos but there are two items of interest involving Purdue people that subsequently became public knowledge. One of these involves the tragic death at Los Alamos of the Purdue physics graduate student Harry Daghlian. He was one of two scientists who died at Los Alamos during the war as the result of a radiation accident involving a runaway nuclear pile. The second is on a more pleasant note, and involves the two staff members, who were referred to above by Schreiber, and who were responsible for giving the name "barn" to the unit of nuclear collision cross section of 10-24 cm2. The tradition of naming a unit after some great man closely associated with the field ran into difficulties since no such person could be brought to mind. Failing in this, the names Oppenheimer and Bethe were tried, since these men had suggested and made possible the work on the problem with which the Purdue project was concerned. The "Oppenheimer" was discarded because of its length, although in retrospect an "Oppy" or "Oppie" would seem to be short enough. The "Bethe" was thought to lend itself to confusion because of the widespread use of the Greek letter. Since John Manley was directing the work at Purdue, his name was tried, but the "Manley" was thought to be too long. The "John" was considered, but was discarded because of the use of the term for purposes other than as the name of a person. The rural background of one of the authors then led to the bridging of the gap between the "John" and the "barn". This immediately seemed good and further it was pointed out that a cross section of 10-24 cm2 for nuclear processes was really as big as a barn. Such was the birth of the "barn". Of course, the need to create a new unit was forced on the nuclear physicists at Purdue by the need to communicate telephonically with others on highly classified topics. The name caught on and the unit of the barn was subsequently adopted at Los Alamos and thus became classified. The two authors of the proposal, described their suggestion in the form of a report on 13 September 1944 and this resulted in the issuance of a Los Alamos report "Origin of the Term `barn'" (LAMS523) on 5 March 1947. It was finally declassified on 4 August 1948. The department's high standing in the physics community prior to the war, was due in large measure to the cyclotron and thus to its cutting edge research in nuclear physics. Although Lark-Horovitz, the prime mover behind most things in the department including the construction of the cyclotron, and pioneering radioactive tracer techniques, his interests were elsewhere once nuclear physics research at Purdue had been established. Of the eight or so articles he published between 1938 and 1941 while the cyclotron was in full operation, only two dealt directly with nuclear physics. (9),(10) Nevertheless, in keeping with his personality, he was always on the alert for new developments in physics and shortly after America entered the war he was instrumental in having the department enter an entirely new field of research. The transition of the department from a powerhouse in nuclear physics to one in semiconductor physics makes an interesting story. The department's entrance into the field of semiconductor physics began innocently enough. In the fall of 1940 Hubert James went on leave from the department to the then recently formed Radiation Laboratory at MIT. In early 1942, Lark-Horovitz wrote to James asking him if he could obtain for the department a contract to work on some aspect of the research at the Radiation Lab. (11) One of those on a long list suggested by James involved research to help develop crystal diode rectifiers and this was selected by Lark-Horovitz. In brief, the problem was the following. Crystal detectors using semiconducting sulfides and oxides (e.g. CuO, PbS (galena)) were widely used in the early days of radio but became obsolete with the invention of the vacuum diode tube, which is a much more reliable and stable device. Interest in crystal detectors was revived with the coming of radar in the late 1930's when it was recognized that radar could be further improved only by utilizing short wavelengths below the 10 cm range for the transmitting beam. At about that time, (1939), a compact source of microwaves of about 10cm wavelength became available with the invention of the magnetron by J.T. Randall and H. A. H. Boot at the University of Birmingham. To take advantage of this improvement it was necessary to devise a receiver effective at these shorter wavelengths as well. Unfortunately, the receivers used for the longer wavelength radar had at their hearts the vacuum tube diode which became unstable and thus unusable at the higher frequencies. Thus a vast program of research was initiated in the U.S. to develop effective, point contact crystal rectifiers for use with radar. By comparison to vacuum tube diodes, crystal rectifiers, because of their low capacitance could operate better at microwave frequencies, and because of their small size and low power requirements were expected to be very useful in microwave radar receivers. Rectifiers of silicon had already been successfully employed in the "red-dot" detectors developed in England. Now Lark-Horovitz, as a first lieutenant in the Austrian Signal Corps, in World War I, had operated a crystal radio for his section and had in addition worked on crystal detectors as an assistant at the University of Vienna in the 1920's. (11) It was thus natural for him to propose to the Radiation Lab (on 24 January 1942) a vaguely stated research program that included: construction of a 10 cm emitter; investigation of crystal faces by electron diffraction and electron optics, and the investigation of various detector combinations for sensitivity and ability to withstand shock, etc. The proposal made no mention of germanium but dwelt exclusively with galena (lead sulfide) as rectifying material. Following the Radiation Lab's approval of the proposal(12), in March 1942, Purdue's efforts quickly turned to germanium as a rectifying material when the galena rectifier, which worked well at long wavelengths became unstable at 30cm. Prior to working on germanium, the group also worked briefly with silicon rectifiers but dropped this research when it realized that it had been well studied in Britain and by the Radiation Lab at MIT in the U.S. That germanium was also capable of producing rectifying action was already known at the time from the literature; indeed germanium rectifiers had already been introduced into microwave technology by the Sperry Gyroscope Co. However, there were many serious problems in using germanium for this purpose; foremost was the poor performance of the germanium crystal rectifiers due to their instability and their inhomogeneity, because of the lack of purity of the available semiconducting material. Lark-Horovitz's idea to study germanium as a suitable rectifying material was immediately accepted by the Radiation Lab and led to the modified contract between Purdue and the Office of Scientific Research and Development, a unit of the National Defense Research Council, to supplement the efforts of the Radiation Laboratory, in improving radar technology. In part, Lark-Horovitz' goal in taking on the contract was to utilize the department's resources to support the national war effort as well as to obtain research support for a dwindling number of staff members and graduate students in the department. Nevertheless, it was a first step in developing at Purdue a program in semiconductor research which would lead to international recognition lasting long after the end of the war. The element germanium has an interesting history. It was first predicted to exist in 1870 by the Russian chemist Mendelejeff who named it Eka-silikon, and was discovered physically 13 years later in 1883 by the German chemist Winkler who found it had precisely the properties earlier predicted by Mendelejeff. For a long time it was thought to be a very rare element. The comparatively wide distribution of germanium, particularly in silicate materials, was only discovered much later in 1930 by a group of chemists at Cornell University and simultaneously by a group in Göttingen and other groups in Europe. They found that there are about 7 grams per ton of germanium in sediment minerals as compared, for example, with 40 grams per ton of tin. Thus its distribution and availability was far greater than originally anticipated. As is carbon, germanium is tetravalent and crystaline (at room temperature) and belongs-along with carbon, silicon, tin and lead--to the fourth column of the periodic table. The pure substance is an intrinsic semiconductor, as is silicon, and is characterized by the fact that its electrical properties can be changed over a wide range by the addition of certain impurities, a process called doping. Eventually it was recognized that the addition of impurities from the third column of the periodic table, such as aluminum, galium and indium, produces a "p-type" semiconductor in which conduction is via positive charge carriers. While the addition of impurities from the fifth column of the periodic table, such as phosphorous, arsenic and antimony, produces "n-type" semiconductors in which the electrical carriers are negative as in ordinary metals. It is this versatility associated with doping that enables one to control the electrical properties of semiconductors and makes them of such wide importance in industrial applications and thus for the war effort. With a contract from the National Defense Research Council (NRDC) at hand, Lark-Horovitz recruited some half a dozen professional faculty members ( R.N. Smith, H.J. Yearian, I. Walerstein, E.P. Miller, V. Johnson, and for a short time, R. Sachs) from within the wartime-depleted Purdue staff. They had diverse backgrounds (in x-ray and electron diffraction, nuclear physics, cosmic rays, and spectroscopy) and were assisted by about a dozen beginning graduate students. Certainly, none of the participants had any prior experience with metallurgy, crystal growth, semiconductors or microwave radar, except Lark-Horovitz who had worked with CuO rectifiers in the Signal Corps of the Austrian army during World War I. Given these circumstances, it is amazing how much this group accomplished in the interval 1942-46. These accomplishments appear even more astounding when it is realized how little was generally known at that time about semiconductors. There was even some question, at least in Lark-Horovitz's mind, whether germanium, the eventual target of Purdue's research, was a semiconducting material at all. At the time there was no such thing as a materials science, and no facilities for growing single crystals. The growth and doping of crystals to control semiconductor properties was hardly a science, and not even an art in those days, as evidenced by the fact that the initial polycrystalline, inhomogeneous germanium ingots grown at Purdue were doped with elements from a good portion of the periodic table in order to determine which would make the best diodes. When the Purdue final report on the semiconductor project was written after the war, it was stated that helium and tin doping gave the best rectifiers. It was not recognized that it was the impurities in these dopants which were responsible for controlling the electrical properties of the germanium samples. (The elements, helium and tin, have no influence on the electrical properties of semiconductors.) Ultimately it was recognized that Group III impurities produce p-type materials, and Group V impurities produce n-type materials. Of course, just as for wartime nuclear physics, research on the germanium project was carried out under strict wartime secrecy. Results(13) were given in secret reports only to those with appropriate clearance and a "need to know". Towards the end of 1945, all of the Purdue research on semiconductors was declassified. As orchestrated by Lark-Horovitz, the research on the development of point contact crystal rectifiers at Purdue was a model of scientific organization. Although, as conceived and contracted for, the project was mainly of an applied nature, Lark-Horovitz insisted that it be supported by a variety of studies involving basic research. Lark-Horovitz and Vivian Johnson, for example, carried out many theoretical analyses of the data obtained. The work itself was divided among three mutually supporting groups. The most important among these initially was the group dealing with the purification of germanium. Since no available external source of germanium crystals was available, it was necessary to build a facility for purification and crystal growth of relatively pure, high resistivity germanium crystals. Purified germanium oxide was provided by the Eagle-Picher Co. in Missouri. Randall M. Whaley who headed this part of the project developed techniques for purifying germanium dioxide (GeO2) powder and subsequently reducing it in hydrogen. (15) The residue was then subject to prolonged heating in a vacuum to purify it. (15) He grew the first germanium ingots. Controlled doping with impurities was achieved to vary the resistivity and to give either p-type or n-type material. Although the materials were inhomogeneous and polycrystalline, it was possible to cut selected samples for Hall and resistivity measurements, and for making diodes. With doped germanium crystals available, their electrical and galvanomagnetic properties (resistivity, Hall effect and thermoelectric power) were then measured and analyzed by I. Walerstein, and E.P. Miller, and supported by students, A. Middleton and W. Scanlon. Such measurements were necessary to characterize the germanium ingots after they were grown, and to provide the necessary feedback for improving the crystal growth techniques. The theoretical analysis of the results by Lark-Horovitz and V.A. Johnson established the basic semiconducting properties of germanium: the width of the intrinsic energy gap and the activation energies of various impurities. From the temperature dependence of the mobility of electrons and holes, the relative contributions of lattice and impurity scattering could be determined. This work became the basis for making germanium the prototype semiconducting material. A helpful contribution to the analysis was made by Victor Weisskopf and his student Esther Conwell at Rochester University who, at the suggestion of Lark-Horovitz, derived an expression for the cross-section for scattering of free carriers by ionized impurities, a vital factor in analyzing the mobility of the carriers. The third and largest group was responsible for the fabrication, testing and evaluation of the final crystal rectifiers. It consisted of Hubert J. Yearian and Ronald Smith plus a number of graduate students and assistants. Notable among the latter was Seymour Benzer who was to make one of the decisive discoveries in the project and to go on, after receiving the Ph.D. in physics, to become widely recognized in the fields of molecular biology and neurobiology. The crowning technological achievement of this group was the manufacture of high quality crystal diodes by a process which was ultimately patented by Purdue. The factors in this success were the production of good germanium material, the development of successful surface chemical etching techniques and the discovery of the process of "welding" the tungsten "whiskers" unto the germanium chips. This generated extremely stable diodes, which could sustain high back (or reverse) voltages (> 100 V), without the unstable, burnout problems of the then existing silicon diodes. The technological contribution of these diodes became much more important after the war, and in fact stimulated the establishment of the post-war semiconductor industry. Dr. James submits a number of problems to be worked on outside of the Radiation Laboratory, among them the problem of crystal detectors. Because of my experience in this field it was offered to the Radiation Laboratory that the Purdue group should engage in this type of work. Visits to various installations and discussions to learn the present status of detector development. Literature study ... Sperry Gyroscope Laboratory had introduced at this time crude germanium as a detector. Literature studies on germanium detectors. Organization of the Purdue group with the program to purify germanium. Whaley's experiments on purification of germanium using all methods known at this time. First experiments on melting under helium, hydrogen reduction, etc. Meeting at M.I.T. Present: E.U. Condon (Westinghouse), F. Seitz (University of Pennsylvania), H.Q. North (General Electric), T.A. Becker (Bell Telephone), N. Rochester (Radiation Laboratory), K. Lark-Horovitz and R.G. Sachs (Purdue) ...K. Lark-Horovitz announced the production of p- and n-type germanium by addition of either boron, aluminum, gallium, indium or arsenic, bismuth from the other series. The next day North approached K. Lark-Horovitz and asked for permission to work on germanium at General Electric. Development of purification and production of larger ingots during May, June and July. First detector units produced in the summer of 1942. Visit of Rochester to Purdue and assignment to investigate "burn-out" in germanium crystals ... Lark-Horovitz announced for the first time that germanium and silicon are intrinsic semiconductors, as substantiated by findings at the University of Pennsylvania and also by findings in the literature, but not recognized before. During burn-out experiments Benzer discovered that welded units with whiskers will still rectify. Lark-Horovitz pointed out that D.C. welding might be used for production of units. High-back-voltage characteristics observed in some materials by Benzer ... Purdue group divided into three essential units: (a) electrical measurements of Hall effect, resistivity, thermoelectric power under K. Lark-Horovitz, (b) purification and melting--R.M. Whaley, (c) burn-out and high-back-voltage rectifiers--S. Benzer, R.F. properties--H.J. Yearian and R.N. Smith, theory--first R.G. Sachs, then V.A. Johnson. High back voltage observed first in Whaley's high vacuum experiments. Continuation of these experiments by Benzer led to high back-voltage diode. High back voltage observed up to 150 volts and reported at Radiation Laboratory meeting in October 1943. Conference with H.Q. North, General Electric pointing out the possibilities of future germanium development. Assignment of mass production to Bell Telephone Laboratories. Purdue has the duty to supervise development and to meet regularly every six months at the Bell Telephone Laboratories with a group from National Defense Research Corporation (NDRC) and a group from the armed services. At the end of the war the Purdue group had (a) shown electrical properties to be predictable from impurity content, (b) predicted resistivity and thermoelectric power in the range of temperature available at this time (down to liquid air temperature) from the number of electrons given by Hall effect measurement, (c) determined the mobility ratio for holes and electrons. First infrared measurements by K. Lark-Horovitz and K.W. Meissner yielded the dielectric constant for Si 13, for Ge 16-17. High-back-voltage rectifiers were perfected and the present-type cartridge introduced by R.N. Smith. Methods of melting and production of high-purity ingots brought to high perfection by R.M. Whaley. The group decides to abandon development of detectors and the practical applications and to concentrate primarily on the basic investigation of germanium semiconductors. A more comprehensive description of the semiconductor work for the war-time period was presented in the Contractors Final Report(17) entitled "Preparation of Semi-Conductors and Development of Crystal Rectifiers". It contains detailed summaries of the work written by the various members of the research staff and covered 136 pages and 30 figures. The report listed the interactions with a host of organizations (Bell Labs, MIT Radiation Lab, British Admiralty, General Electric, Sylvania Electric, Sperry Research Labs, Eagle Picher, Westinghouse) and Universities (Rochester, MIT, Pennsylvania, Catholic and Ohio State). Amongst the visitors and consultants to Purdue were such recognizable names as Bethe, Bleaney, Herzfeld, Seitz, Shockley and Weisskopf. This diverse interaction, fostered by K. Lark-Horovitz, helped generate Purdue's fame for its semiconductor work. The final report contains recommendations for future work. The most interesting recommendation was that the then current rectifier model needed to be revised because of the many anomalous properties observed. The anomalies listed below, turned out to have much greater significance than was initially apparent: (1) The high back voltage capability of the rectifiers, while technologically very important, was not understood; (2) R.N. Smith found the capacity of the rectifiers to be anomalously large; (3) H.J. Yearian observed very strange behavior of the recitification efficiency of the diodes at high frequencies; (4) Ralph Bray, then a student of Lark-Horovitz, discovered very anomalous behavior of the forward-biased, spreading resistance component of the rectifiers at both D.C. and high frequencies; (5) S. Benzer found very interesting photovoltaic and photoconductive effects associated with p-n junctions inadvertently present in inhomogeneous germanium samples. While much of the war-time semiconductor work at Purdue received immediate world-wide recognition, the significance of the anomalous properties was not initially appreciated either at Purdue or elsewhere. Recognition of their significance had to await post-war work at Purdue and the invention of the point-contact transistor by John Bardeen and Walter Brattain at Bell Labs a few years after the war, in Dec. 1947. All of the war-time germanium work at Purdue, including the anomalies, not only influenced the experiments which led to the eventual invention of the point-contact transistor, but also contributed to the understanding of the physical mechanism of its operation. The pursuit of the photoelectric effects eventually led to post-war studies at Purdue and elsewhere of the optical properties of germanium and to the development of nuclear particle detectors and solar cells. An account of the relationship of the war-time work at Purdue to these various developments will be given in the next installment of this history. Thus, thanks to Lark-Horovitz's leadership, both in starting the nuclear physics program in the 30's and the germanium program during the war, Purdue played several important roles during the war. The germanium program also laid the foundation for the post-war growth and development of the Physics department and the world-wide growth of the field of semiconductors both in the academic and industrial worlds. Contained in "Karl Lark-Horovitz and Physics at Purdue 1928-1958", a transcription of words spoken on the evening of 24 April 1958 by members of the physics department. W.J. Henderson, L.D.P. King, J.R. Risser, H.J. Yearian and J.D. Howe, "The Purdue Cyclotron", J. Franklin Institute, 228, 5 (1930), pps. 563-579. In 1953, after the construction of Lilly Hall, the Biology Annex was renamed Stanley Coulter Annex and subsequently it was renamed Pierce Hall. Today (1996) the class of 1950 Lecture Hall occupies the ground where the old physics building had been originally located. R.E. Schreiber, private communication to S. Gartenhaus, June 1996. C.P. Baker, M.G. Holloway, L.D.P. King and R.E. Schreiber, "The Cross Section for the Reaction 20 (30,240)n", Los Alamos Technical Report, LAMS11, 17 September 1943. C.P. Baker, M.G. Holloway, L.D.P. King and R.E. Schreiber, "The Cross Section for the Reaction 20(230,240)P", Los Alamos Technical Report, LAMS2, 28 June 1943. K. Lark-Horovitz, J.R. Risser and R.N. Smith, Nuclear excitation of Indium with alpha particles, Phys. Rev. 55 879 (1939). K. Lark-Horovitz, with R.E. Schreiber, Uranium fission with Li-D neutrons; energy distribution of the fission fragments, Phys. Rev. 60, 156 (1941). Paul W. Henricksen, "Physics at Purdue", Osiris 3 237 (1987). OEMSR-362, Crystal Detectors for UHF, $11,600, 1 March 1942-28 February 1943. Vivian A. Johnson, "Men of Physics, Karl Lark-Horovitz'', Pergamon Press, New York, (1965), p. 36. See reference 13, pps. 149-151. See reference 13, p. 252. Quoted in its entirety in reference 13, p. 32ff. Report NDRC No. 14-585 for OSRD Contract OEMsr-Division 14, NDRC, edited by K. Lark-Horovitz, covering the period 1942-1945.